A fifty-percent price hike is not something most people would take lying down, and when the price involved is that of an item as revered as Taco Bell's Beefy Crunch Burrito, watch out. What the San Antonio Express-News called a "burrito-triggered spree" may ensue. Ricardo Jones was so upset when he learned that the seven burritos he ordered at the drive-through window were going to cost $3.50 (plus tax) more than he had expected that he pulled out a pistol and took a shot at the manager. "He pointed a gun at me, and he fired it," the manager said. "I leaned to the side" – what is this, The Matrix? – "and there was a pop but nothing happened." 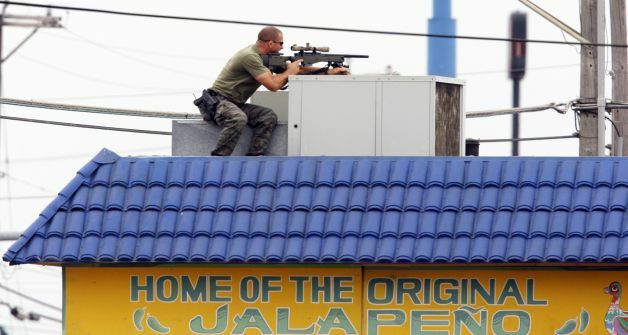 The manager said he then saw Jones park his car, get out, and put another handgun and an assault rifle on its roof. At that point, he decided there was a problem and called the police. When the manager locked the doors, Jones fled. It turned out that all three of the weapons were "air-powered," not firearms, but nobody knew that for sure at the time. This is why snipers were deployed to deal with a burrito-pricing dispute. Responding quickly, San Antonio police spotted Jones's car less than two miles away and two patrol units pulled him over. He then got out of the car with the assault rifle (again, the BB-firing assault rifle) and allegedly pointed it at the officers. At this point things get a little unclear. According to the Express-News, police initially reported they had "exchanged fire" with Jones and that he shot out the windshield of one of the police cars. But later, they said they could not be sure whether Jones had actually fired "because his rifle was also a BB gun and they could find no spent BBs." Okay, but that left unsolved the mystery of who shot out the windshield of the police car, if it wasn't Mr. Jones. 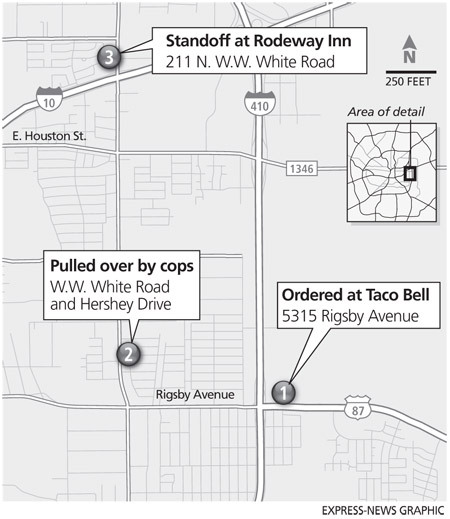 The report simply states that the windshield-shooter was "unclear," but unless there was a grassy knoll nearby (and the Express-News did print this graphic that makes it look a little like Dealey Plaza) I think we can assume the officers somehow shot out their own windshield. I'm not saying they shouldn't have drawn on somebody pointing what looked like an assault rifle at them, just that their aim was a little off. Anyway, after the "exchange of fire," Jones got back in his car and drove off to a Rodeway Inn where he was apparently staying. Snipers were deployed, roads blocked off, areas evacuated. "No one needs to get hurt," said a negotiator through a megaphone. Jones remained stubbornly silent, possibly still fuming, certainly still hungry. After three hours, tear gas brought the standoff to an end. Jones was charged with two felony counts of aggravated assault. The really sad thing is, it was all a big misunderstanding. "They did use to be 99 cents," the Taco Bell manager said, "but that was just a promotion."